Needing to know how to contact Megabus has been hair-pulling at times. This article represents hours of work, tears and some frustration. Some of the information is not readily available online nnd has come from having to contact Megabus through other phone numbers and signs on the actual bus. Megabus on deck at Union Station in D.C. I'm posting the contact information for Megabus that I have been able to find so far. If you can add anything, please email me or leave it in the comment section below. Your input can help me create a quick resource that everyone can use. When you want to how to contact Megabus it's usually to make or change a reservation. 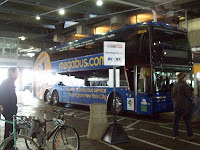 The website http://us.megabus.com seems to be the best place to book the trip. I have found the phone number to be the best to make a change or confirm. It has taken me as plong as 45 minutes to speak with a live person at 877-GO2-MEGA (1-877-462-6342). If you contact Megabus by phone, be sure to have a full battery. I have also found the following contacts to be helpful. Megabus uses the email address of inquiries@megabus.com for customer service issues. I used the email address to get a refund from a bad experience. The responses took anywhere from a few hours to days. The written record helped but I still had contact Megabus by phone a few times. Delays are announced via support@megabus.com. Make sure that this address is whitelisted so the messages will come through. It is an unmonitored automated system. No response will be given. At the time of booking, riders can register for an automated text messages. It is for alerts only so you can't contact Megabus by text message. Not listed on the website is another phone number so you can contact the customer service department. The number is 908.282.7420. Megabus representatives on this line help with customer service related issues only. They do not make reservations. Another piece of contact information for Megabus is the emergency number of 888.970.723. Riders are instructed to call 911 to receive emergency help from local authorities.